Grilled meat, fish, vegetables and the added kick of chillis? What more can you ask for? Sinuglaw cooked in Knorr Sinigang sa Sampalok Mix Original and Knorr Pork Cubes is perfect for your next party treat. 1 This recipe may seem long but we assure you that it’ll be worth it. So, let’s begin by making the sinuglaw. First, place the tanique in a bowl with ¼ cup vinegar and leave it for 2-3 minutes only. 2 The next step is to combine the tanique with the cucumber, onion, ginger, chillis, grilled pork belly, calamansi juice and the remaining vinegar. 3 Throw in the mashed Knorr Pork Cube and mix this well. Then, cover the mixture and let it stand in the chiller for at least 10 minutes. 4 Since our Sinuglaw is done, we need to make a container for it by cooking the wonton wrappers and making them into cups. 5 Get a pot used for deep-frying and fill it with oil. Get it nice and hot over medium high heat. Press one wonton wrapper into a medium-sized ladle using a smaller ladle. While holding the two ladles, gently deep-fry the wrapper in oil until crisp, forming a cup. Place on top of a tray lined with paper towels. Do the same with the rest of the wrappers. 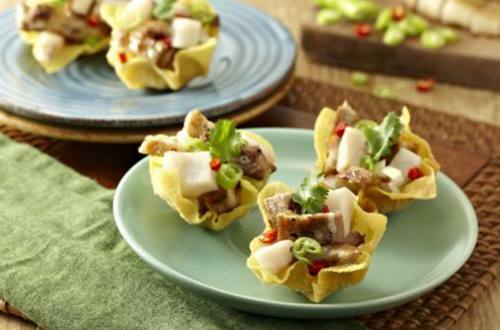 6 All you need to do is to spoon Sinuglaw into the wonton cups, top it with chopped cilantro and there you go! This dish is done! 7 It sure is worth the wait when you try this Sinuglaw Cups Recipe. Mmmmm, it’s just too good to just be an appetizer or snack. You can munch on it anytime and any day because you simply won’t be able to resist!